Quick pickles are my favorite. You can make them with almost any ingredient, and they are ready as soon as they are cool enough to eat! These came from the need for more cheeseboard ingredients, and they pair with cheese amazingly. Soft goat cheeses are my favorite, but anything creamy to cut through the sweet tanginess of the pickles works. Crush whole spices with a mortar and pestle, or with a large pot on a cutting board. Combine all ingredients except squash in a medium pot and bring to a gentle boil. Once boiling, bring down to a simmer and let infuse for 2-3 minutes. While pickling liquid is infusing, cut the squash in half, lengthwise. Remove the stem top from each half, and using a spoon, scoop out the seeds. Save seeds for toasting, or discard. Using a mandoline, or very sharp knife. cut the squash into strips as thin as possible, no thicker than 1/16th of an inch. 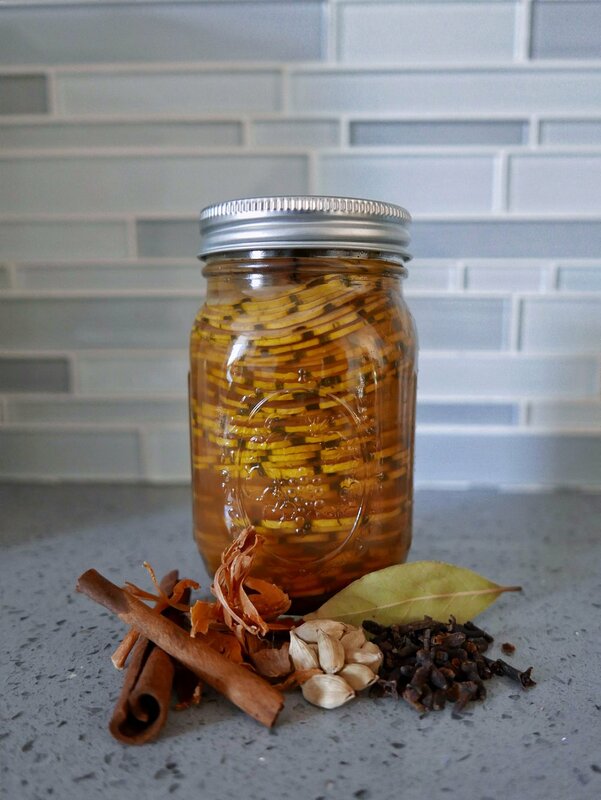 Place all squash slices into a sterilized canning jar, or heatproof container. Carefully pour pickling liquid over squash slices, then cover. Pickles are ready to eat when cool! *You can use any squash for this, including acorn, butternut and pumpkin! Just remember, peel any thick-skinned squash, and make enough pickling liquid to cover the slices.